Genmaicha is one of the more easily identified teas, thanks to the noticeable presence of toasted rice among the tea leaves. To the uninitiated, this might at first seem slightly peculiar. But, as Genmaicha lovers know, these little pieces of toasted rice are the perfect complement to the sweet, grassy flavour of Japanese green tea. The tea used in Genmaicha is typically sencha– a good grade green tea, although not the highest grade (that honour is reserved for Gyokuro). The English Tea Store’s Genmaicha is no exception: sencha is blended with toasted rice to create a tea whose aroma is exactly what I would expect from a Genmaicha. 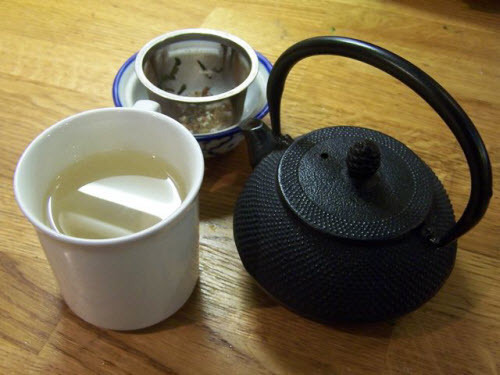 As with any green tea, this tea is best brewed with water that has not been brought fully to boil (this prevents the tea leaves from being burnt and tasting bitter). Sencha is not as delicate as Gyokuro, and the toasted rice flavour does a lot to mellow out any slight over-steeping of the tea leaves. As such the brewing time does not have to be as precise as it does for a Gyokuro or higher grade, pure sencha. However, Genmaicha can still become bitter if left too long, and I would not advise wandering off whilst your tea is steeping. For this particular Genmaicha, 45-60 seconds produced a good tasting brew on the first steep. Depending on your taste preferences, it could perhaps be left up to 75 seconds. Whilst the sencha tea leaves can be re-steeped, the toasted rice does not re-steep very well, and as such the second brew had a much lighter rice flavour, almost tasting like a pure sencha. I enjoy Genmaicha for the distinct flavour that the toasted rice adds, and as such I do not usually enjoy second or third brews of this tea. However, some people may enjoy, or even prefer, the lighter rice flavour the second time around, and so it is definitely worth trying a second steep if you are new to this tea, or if you have not done so before. All in all, the English Tea Store Genmaicha is a tea with a good balance of toasted rice and sencha flavours, and it compares favourably to other Genmaicha blends that I have had the pleasure to try. See more of Elise Nuding’s articles here.